For a personalized keepsake that expresses your sentiments in a truly romantic way, this wine bottle is a ravishing gesture they'll remember forever. Our best California red wine is engraved with an exclusively designed red scroll heart. Underneath the heart, your message of choice is engraved, and the presentation is completed with a beautiful gift box. One bottle of California Winemaker's Red sandblasted and painted with Red Scroll Heart Design. Your Personal Engraved Message Underneath. Arrives gift ready in a signature gift box. Personalize It! 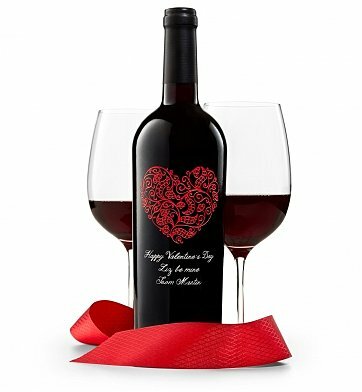 Your wine gift comes sandblasted with a red scroll heart design and your personal message underneath, in white cursive as shown. Write up to three lines, 21 characters each - complete the personalization details on the next page of checkout process. The engraving is then treated with a smooth, lustrous paint to complete the presentation. Sandblasting is a distinctive engraving technique that creates a permanent, semi-opaque, elegant etching onto an item's surface. Measures 15" x 5" x 5"
Red Romance Engraved Wine Bottle is a hand delivered gift. These gifts are delivered by one of our local design centers located throughout the United States and Canada. Same day delivery is available for most gifts when ordered before the cutoff time. The cutoff time for Red Romance Engraved Wine Bottle is in the recipient's time zone.